Imagine if you have a recorded .tivo video to show off to everyone in the house, rather than huddle together for a glance, put videos on the big screen TV will no doubt be a better alternative. And this is why video streamers like Plex and Apple TV come into being. 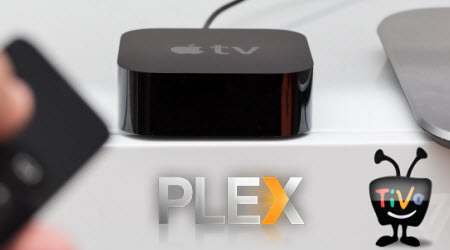 As long as you have a home network connection or Internet connection, you can share Tvio connections from Plex and Apple TV onto DLNA-certified TV for watching locally or remotely. Here shows the convenient approach. Plex is a media server application that will help you stream music, movies, and your other media collection onto your computer, TV, PS3, Xbox360, Android, iOS, and other DLNA-certified devices. Frankly, Tivo filea are generally referred to as "encrypted video format". Neither Plex nor Apple TV will know "how to play Tivo-like sources". If you really want to use Plex to stream Tivo onto Apple TV for playback, the easy workaround is to convert Tivo to a fully compatible format with Plex/Apple TV, like H.264/MPEG-4 video up to 720p. 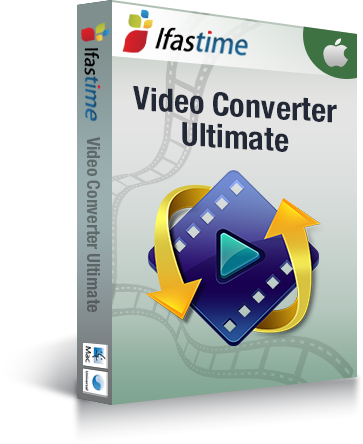 Whenever looking for the best software program to convert TiVo to H.264/MPEG-4, iFastime Video Converter Ultimate for Mac should definitely stand out as the best solution to remove Protection from Tivo and finish Tivo conversion for Plex/Apple TV with high quality and fast encoding speed. Besides outputting MP4 video, it can also help you to convert TiVo to other formats like MPEG, AVI, WMV, MKV, etc., all you need to do is to set the format as what you want your file to be converted in the "Format" bar. What's more, you will have the privilege of personalizing your video files prior to conversion. This is because it comes with a built-in editor that will give you the freedom to manipulate key aspects of the files. You can trim it down to reduce size; you can embed a watermark to brand the video or add a subtitle. If there are unwanted contents in your video, you can remove using the editor. It has an equivalent Windows version to aid you to solve TiVo to Plex/Apple TV incompatible issues on Windows PC. Download it below and follow the tips below to transfer and convert TiVo to Plex Media Server for playback on Apple TV easily. As we know, using TiVo box, we can record TV shows. And we can easily transfer recorded TV shows to Mac so that we can enjoy the TV shows anytime. Launch the TiVo Converter. 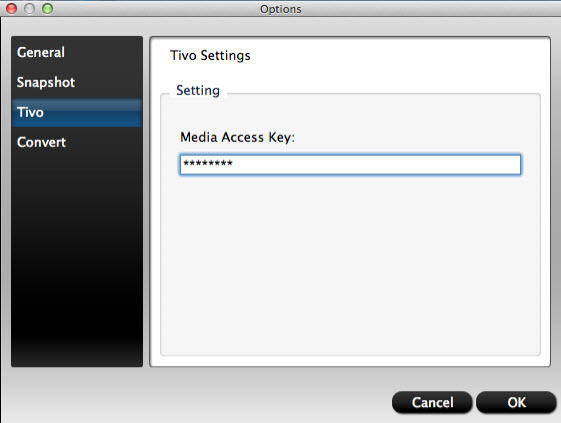 Click Tools > Options and choose "Tivo" tab, here you need to enter Media Access Key, and click "OK" to confirm. Click "Add video" button to import TiVo shows to the best TiVo Converter. The time for importing depends on the number of your TiVo files loaded. Click on the dropdown menu of "Format" and then move your pointer to "HD Video", under the sublist, "H.264 HD Video(*.mp4)", "MPEG-4 HD Video(*.mp4)", are compatible with Plex and Apple TV. Click the "Start conversion" button; it will convert TiVo to Plex/Apple TV in no time. You can find the converting process in the "Conversion" interface. 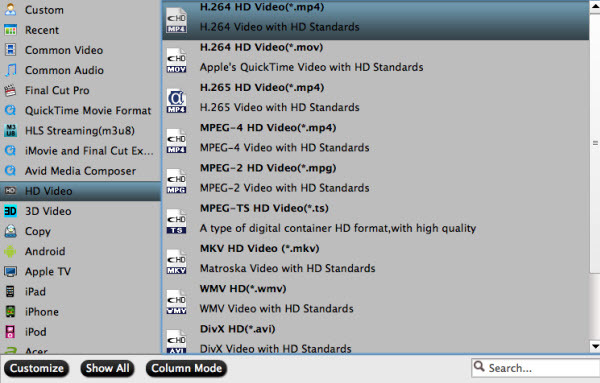 After the TiVo to MP4 conversion, you will be able to get the output files via clicking on "Open" button effortlessly. Now you can add TiVo to Plex and stream to Apple TV for playback easily. TiVo is a digital video recorder, developed and marketed by TiVo, Inc. and introduced in 1999. TiVo provides an electronic television programming schedule, whose features include "Season Pass" schedules which record every new episode of a series, and "WishList" searches which allow the user to find and record shows that match their interests by title, actor, director, category, or keyword. TiVo is one of the major file formats that allow for files to be converted from another format for easy playback. Free versions of this format are rare to get these days with paid versions very common in the market. If you experience problems playing your TiVo files on any platform, it will be a reason to convert to MP4 which is a standard format and can play on major platforms like Plex or Apple TV. You can also convert to reduce size of your files.